"This is the first of 5 trail runs in the 8th Annual Be Bold, Run in the Cold Winter Trail Series presented by Ascent Runs. Every run in the series will have two distances to choose from, a 5K and a 10K+. The 5K will usually be between 3-4 miles. The 10K+ will be anywhere between 6-8 miles depending on conditions. If it’s nice we make it 7-8 miles. If it’s not so nice we keep it close to 6 miles. Be sure to check website and Facebook the week leading up to the run for updates. These casual runs were created to keep runners and walkers motivated through the winter months and also as a way to supplement your winter training. " "The idea of a fun race around Donner Lake was hatched back in 1976 by a small group of enthusiastic runners who wanted to make room for all the turkey and pies they were going to be eating in the weeks ahead. Thirty-eight years later the Donner Lake Turkey Trot is a popular event attracting 200 runners from Reno, Sacramento & The Bay Area as well as many locals who enjoy the excuse to support a good cause & get out for a morning run/walk. Auburn Ski Club Junior Nordic Team organizes the race as a fundraiser and a way to get ready for the ski season. The history of the event has always been to be fun and funky and happens regardless of the weather. The event has happened with snowstorms, below freezing temperatures, ice, rain and beautiful sunny days. Auburn Ski Club has upgraded the timing of the event from the self timing days, but still tries to keep the spirit of fun and families." "Join us for the Run with the Girls, a 5K run/walk or 10K run in Reno, Nevada at Damonte Ranch High School. It is family friendly. This is a great event for competitive runners, recreational runners, race rookies, event veterans and walkers of all abilities. All participants receive a unique finishers medal, sweet treat, and more!" Before the football games, the big meal, the parades and the pies, why not get in a little exercise with a few 100 of your neighbors from the community? It’s an event the whole family will enjoy and maybe even a new Thanksgiving Day tradition! 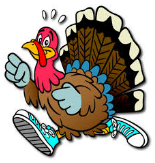 Several events to choose for the day, from the 5K(3.1 miles) run / walk, 8K(5 miles) or the Gobble Wobble 1 mile Kids Fun Run! "The Scheels Turkey Trot at the Sparks Marina has become a Thanksgiving tradition in the Truckee Meadows. It's a great place to spend time with family and friends, and a healthy way to start a day usually filled with a whole lot of eating. New in 2015 was the inaugural costume contest. Runners and walkers were asked to dress up in a fun Thanksgiving outfit for the contest. The three best individual costumes were selected. Lots of fun! The Thanksgiving Day event starts and finishes in the parking lot of Scheels at Legends at Sparks Marina. Participants can choose from a 10K (6.2 miles) run (timed) or a a 2-mile walk or run (not timed). The courses are user-friendly for both runners and walkers. The 10K race utilizes city streets and the local bike path. The 2-mile run/walk starts at Scheels and circles around the Sparks Marina Park. " "Welcome to the 2nd Annual Wobble Before You Gobble in the City of Reno! This is a family fun start to your Thanksgiving Morning. 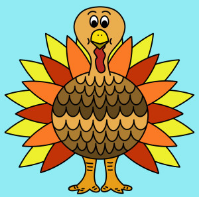 Join us for a beautiful 10K & 5K run/walk/wobble before heading home to your Thanksgiving feast! This great event will take place at the City Plaza!"